Nestled in the solitude of the Alaskan frontier and perched on a mountain top overlooking Denali National Park and the Nenana River Canyon, the Grande Denali Lodge welcomes you to a world of difference where you will find spacious rooms and cabins, great food and the ultimate in eco-adventure. Imagine spending the day heli-hiking, whitewater rafting or flight-seeing and then returning to the comfort of a first-class lodge. Known for relaxed luxury and impeccable personal service, Grande Denali combines the elegance and charm of an alpine inn with the warmth of Alaskan hospitality. The lodge boasts convenient amenities including shuttle service, gift shop, guest laundry and a tour desk to arrange various local activities. 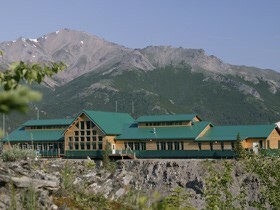 The Grande Denali Lodge offers 154 unique and spacious guest rooms and 6 family size log cabins. Each room is decorated and perfectly appointed with 2 queen beds, central heat & air conditioning, cable television, telephone with data port, coffee maker and private bathrooms equipped with hairdryers and luxury soaps. For families, each log cabin has 1 queen bed, 1 double sofa sleeper, 1 twin sofa sleeper, air-conditioning, microwave, refrigerator, coffee maker, television, private bath and private deck. Breakfast, lunch and dinner are available in the lodge’s highly rated restaurant, The Alpenglow. Specializing in true Alaskan fare, this alpine-looking structure features wall to wall windows and high ceilings with exposed beams. This rustically charming architecture and warm interior decor are complemented by outstanding panoramic views of the Nenana River Canyon and the Alaskan Range. While feasting on the fresh catch of the day, guests can observe river rafters taking on the challenging waters of the Nenana River or sightseeing helicopters lifting off for various tours. Alaska, also known as the last frontier, is a rarity indeed. From the massive snow covered peaks of Mount McKinley to the rugged tundra landscape of Denali National Park to the wildlife-rich seas, the combination of plentiful wildlife and vast protected area makes Alaska the perfect destination for eco-travel. Denali National Park and Preserve covers six million acres and includes Mount McKinley, the tallest mountain in North America, towering 20,320 feet over the rest of the Alaska Range and the surrounding landscape. For the best tour of Denali National Park, the Kantishna Wilderness Trails is a must see. The scenery and wildlife of this majestic day tour is unmatched anywhere in the world. Visitors will travel 95 miles deep into the park aboard a comfortable motor coach to the Kantishna Roadhouse. Moose, grizzly bears, caribou, dall sheep, wolves and eagles are amoung some of the animals that can be seen along the way. Visitors will enjoy refreshments en-route and a tasty lunch served at the Kantishna Roadhouse. After lunch, a dog sled demonstration will be given where observers can learn a little about the history and upkeep of sled dogs. Rubber boots and gold panning equipment will also be provided to those visitors who would like to try their luck at panning for gold in the nearby Moose Creek. For the ultimate viewing of Mount McKinley, the McKinley Summit Tour is not to be missed. Talkeetna Aero Services operates 9 passenger Piper Navajo twin engine planes that have all-weather capability and provide a quiet, smooth flight. This is the only flight-seeing company who summits Mount McKinley. Each passenger has a large window and a personal headset for two-way communication with the pilot. Cabin class seating provides a center aisle and spacious seats with plenty of leg room for passenger comfort. During this hour and twenty minute flight, passengers will have fantastic views of the Alaska Range with its high peaks and awe-inspiring glaciers. The plane will fly over Little Switzerland and the “Climber’s High Camp” at 14,000 feet, then continue over Kahiltna Pass and circle to the north side of the Alaska Range. 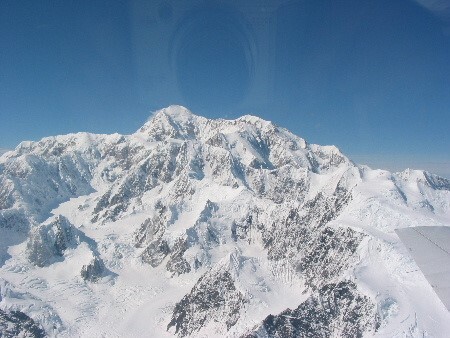 Continuing on, passengers will see the Wickersham Wall, Pioneer Ridge and the Kantishna mining ara before flying over the peaks of Mount McKinley. During the summer mounths, passengers may have the opportunity to see climbers on their way to the summit. www.talkeetna-aero.com All tours can be booked at Grande Denali Lodge.